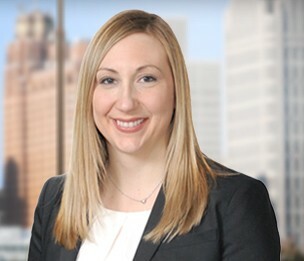 Erica L. Berezny is a senior attorney practicing in the Taxation and Estates group in Dykema's Bloomfield Hills office. Ms. Berezny is experienced in estate planning, probate and trust administration, and related tax matters. Ms. Berezny frequently assists in creating and implementing sophisticated estate plans to accomplish minimization of estate and generation-skipping transfer taxes and to facilitate business succession planning for individuals and families. During law school Ms. Berezny received several academic honors, including the Dean King Scholarship and five jurisprudence achievement awards, including Advanced Legal Research, Sales and Leases, and Corporate Finance. Prior to joining Dykema, Ms. Berezny was on staff in the tax department of a "Big Four" accounting firm, completed a clerkship with a circuit court judge, and served estate planning clients at a boutique law firm.